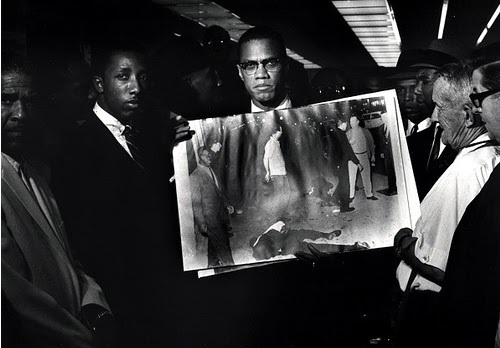 ELMAN: Malcolm X, I wonder if you can tell me very briefly what took place in Los Angeles? You mentioned earlier on the evening that there was police brutality and there was atrocity committed. Would you explain what the incident was? About 11:15 last Friday night, after the meeting was over, two brothers who worked for a dry cleaners had some clothing in their car that they were getting to another brother, and two white policemen puled up to question them, and — in other words, he probably thought that they were burglars or something or thieves. And when he stopped to question them, they stopped and began to give him whatever information he asked. But he got fresh with them, told them to get up on the curb, which they did, and one brother in explaining it was talking with his hands, and the officer told him, don’t talk with his hands. So he took one hand and held it down. So he brought the other hand, and he was still talking, and the officer grabbed it and started twisting it, and from the information that we’ve been able to gather, the other brother moved in to help him. And when he moved in to help him, the other policeman moved in and a struggle took place. And while they were struggling with each other, a dance hall cop, a cop who is the officer on duty in a dance hall, saw the struggle and he started shooting. This caused an alarm to go out to all police cars, and instead of them coming and converging on the place where the incident was occurring, they went straight to our house of worship, our mosque, which was a block away. And when they got to the mosque, they drew up with their guns drawn and shooting. They were shooting the bullets, not in the air but at the mosque when they pulled up. And the secretary of the mosque, the one who was shot down by them, by being the official, he went up and asked the police what did they want. And it was while he was asking them what did they want that they shot him through the heart. And when he fell to the sidewalk, they beat him in his head and handcuffed him and left him laying there on the sidewalk for 45 minutes. . . In the shooting that took place, seven men were shot. Seven Muslims were shot. None of them were armed. None of them were struggling. None of them were fighting. None of them were trying to defend themselves at all. And after being taken to the police station, they were held for 48 hours and weren’t even given hospitalization. We have one now who is completely paralyzed. We just got all of them free last night. . . . And this happened in Los Angeles last Friday night, in the United States of America, not South Africa or France or Portugal or any place else or in Russia behind the iron curtain, but right her in the United States of America. . . .
ELMAN: Do you welcome an investigation of the matter? MALCOLM X: The matter should be investigated. The matter should be investigated by the Federal Bureau of Investigation. What do they look like, running all over this country investigating things that are of no consequence, and they haven’t got sense enough to go into Los Angeles and investigate the Gestapo tactics of the police department out there? What do they look like condemning Eichman for what he did in Germany or the Nazis for what they did in Germany, and you’ve got some Gestapo tactics being practiced by the police department in this country against 20 million black people, second class citizens, day in and day out — not only down South but up North. Los Angeles isn’t down South. Los Angeles isn’t in Mississippi. Los Angeles is in the state of California, which produced Earl Warren, the Chief Justice of the Supreme Court — and Richard Nixon, the man who was Vice President of this country for some eight or nine years and who wants to run for President again. ELMAN: Thank you very much, Mr. Malcolm X. 1964 seemed to mark a turning point in America; with the passage of the Civil Rights Act, a new age in race relations appeared to be dawning. But the states acted quickly to circumvent the new federal law. California reacted with Proposition 14, which moved to block the fair housing components of the Civil Rights Act. This, and other acts, created a feeling of injustice and despair in the inner cities. On August 11, 1965, a routine traffic stop in South Central Los Angeles provided the spark that lit the fire of those seething feelings. The riots lasted for six days, leaving 34 dead, over a thousand people injured, nearly 4,000 arested, and hundreds of buildings destroyed. After the riots, then Governor Pat Brown named John McCone to head a commission to study the riots. The report issued by the Commission concluded that the riots weren’t the act of thugs, but rather symptomatic of much deeper problems: the high jobless rate in the inner city, poor housing, bad schools. Although the problems were clearly pointed out in the report, no great effort was made to address them, or to rebuild what had been destroyed in the riots.